The official French club has sent out a request for all foreign clubs to participate in the genetic research done in Finland( for 2 years now) and now in France.AND the French club has finally agreed to help in the organisation, which is nice..
You should be receiving the info shortly. The info has arrived. Sorry for the letter from the Club only being in French, but you will get the gest. Mrs Loiseau (Perte aux Loups kennel) had initiated this privately, but the CNRS also needs funding support in this research to be done on all the Barbets not just some and she can't do everything herself..That's why there is a club to help us. If you happen to be sure that there is some wrong information on the pedigree you have, make sure you tell them on the pedigree you must sent in with the blood sample. They can detect other breeds in the Barbet, as the last study showed that there were some pure poodles in the breed Barbet. Many of us had not yet received the protocole.You may be receiving an email or a call from a member of the French CTE ( commission technique d'élevage members: Ms Loiseau, Soulier, Fichter) as not all of you are club members in whatever country you live in, but we still need your help in the matter. Helsinki and Rennes communicate so no need to send in samples 2 times. All Barbets are needed: old and young! Here is the link to seeing the oldest Barbet alive,...and well! Harz di Barbochos de Reiau de Prouvenco. As some of you saw the photo of Harz di Barbochos de Reiau de Prouvenco alive and well in Switzerland at a ripe old age of 17, and Poppenspalers' Sangria at 14. ( I zapped the entire post, and will reconstruct). Dixie chick helping in the garden. By the way, her sister D'Illona in Finland is feeling better. The huge bandage she had around her waist has come off. She is now wanting to run and play, dear heart. Thank you for your solidarity, all who sent her and her owner Satu a little "get well soon" note.That's mighty kind of you. As you can see in the link above, there are also poodles that are white and black...but the morphology is also different along with th grooming. Have a look! Wish them luck to break through in France! When they're puppies, they "all" look alike. It's when they grow up that you see that morphologically hidden under all that hair, they are not the same. Nor is the character. And it shouldn't be. The Portie' is a water dog and the Barbet historically has been a gun dog that also looooooooooooves water. The Portie has never been a gun dog. That's why genetically also the characheter is different. Yes, I know he looks like Compay II, but when all is said and done they have the Irish pied coat in common and that's it. 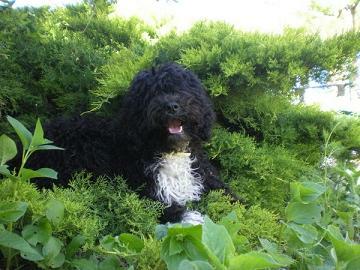 The Portuguese water dog is not a rare breed either.It's a popular breed in the USA.And good for them! Courtesy: bull. 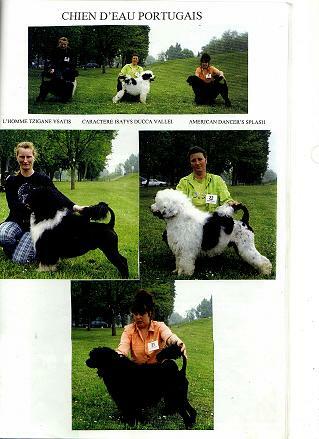 71 Club des Chiens d'eau June 2002. Richard Ramsey Reinagle in 1793. 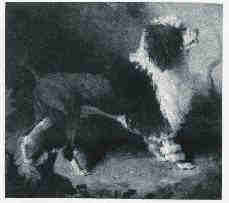 This paiting is claimed to be of a poodle. 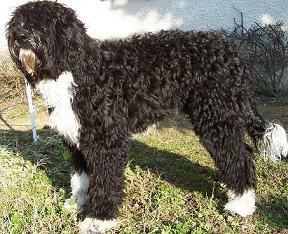 It could be a PWD ( Portuguese Water Dog), but did the PWD even exist then? Not sure...the standard dates to the 1950's? Look at the tail set. The tail is set at 12:10 which is characteristic of a poodle and it curves over on the back which is when you hold it, what the PWD's is supposed to do, not the Barbet. A Barbet's tail is not set the same way, it is set lower and doesn't just "hang there", it forms a crochet at the end and it reaches to hocks.That's easy to see and distiguish. That's genetic diversity that we want to keep before they all become one: the Poodle, the PWD, the SWD and the Barbet. Now we just need to see Bo Diddley from a profile.... And you'll see! Here's a shot of Compay Segundo, my Barbet.